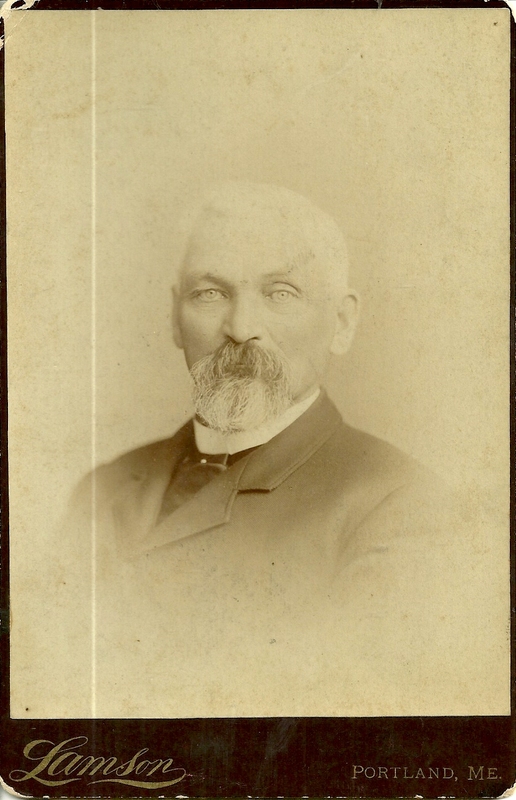 c. 1860s Carte de Visite of John Collins, taken by S. F. Conant of Skowhegan, Maine. 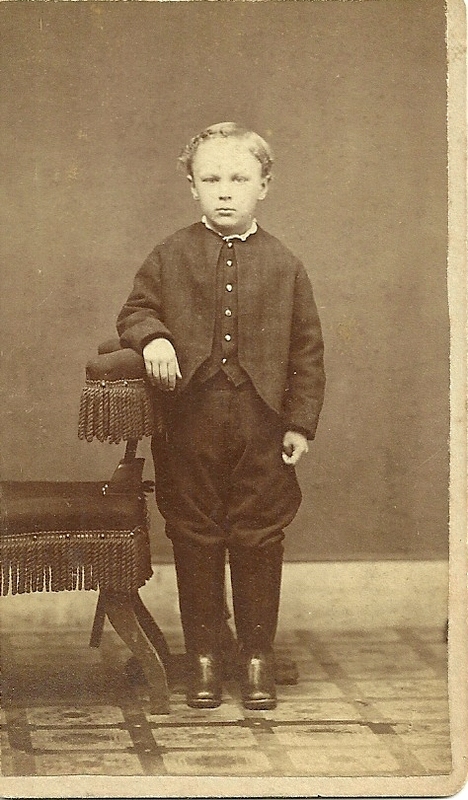 1860s Carte de Visite, below, of John Collins' son John Lee Collins. 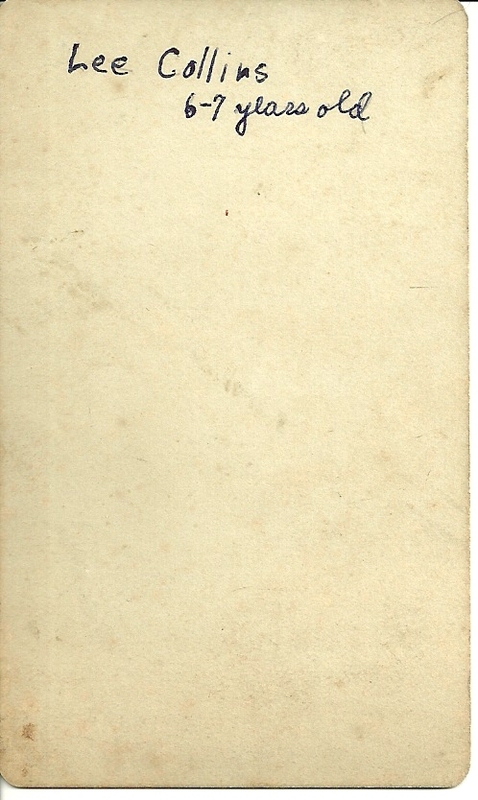 This CDV has no photographer's imprint. Group photograph of John Lee Collins; Fannie Emmie (Mitchell) Collins; Alton Chadbourn; Ethel Stafford Sinclair; Ephraim Sinclair and Ida Gray Chadbourn; taken by A. H. Dinsmore studio of Dover, Maine. John Collins (CDV) was born in July of 1828 at Cornville, Maine, in Somerset County, the son of John and Abigail (Jewell) Collins. His paternal grandparents were Daniel and Mary (Tuxbury) Collins. His maternal grandparents were Jesse and Rebecca Jewell. 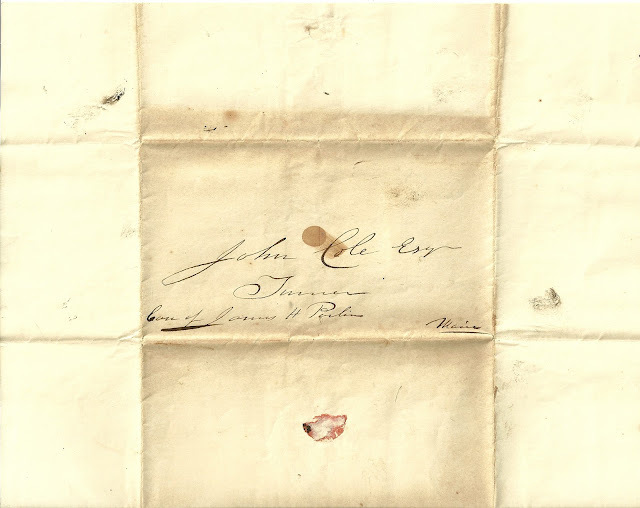 On 7 May 1856, at Lowell, Massachusetts, John Collins married Sarah A. Shorey, who was born in August of 1835 at Bingham, Maine, the daughter of Lot and Eliza (Ayer) Shorey. Her paternal grandparents were John and Mary (Kilgore) Shorey. 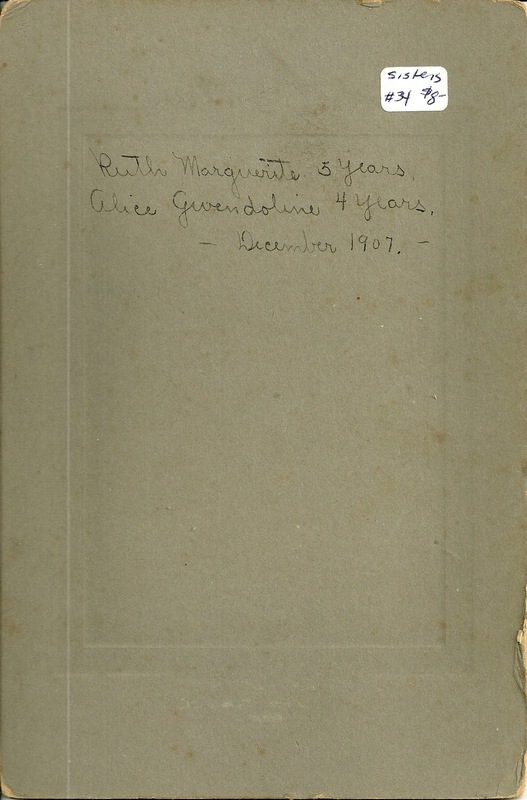 Her maternal grandparents were Samuel and Alice (Kilgore) Ayer. 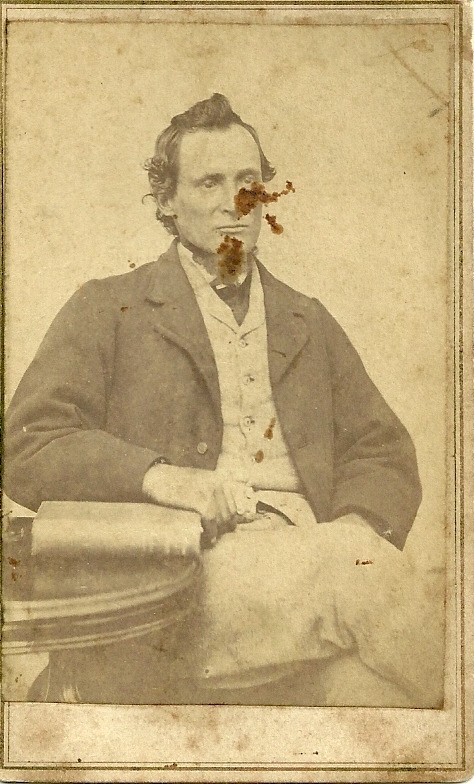 John Lee Collins (CDV and group photo) was the third child of John and Sarah A. (Shorey) Collins. He was born 22 April 1872 at Harmony, Maine. On 5 October 1895 at Wellington, Maine, he married Fannie Emmie Mitchell. Fannie Emmie Mitchell (group photo) was born 9 Mar 1875 at Troy, Maine, in Waldo County, the daughter of James Rackliff Mitchell and his wife Emily Ann Stafford. Her paternal grandparents were James and Sarah (Rackliff) Mitchell. 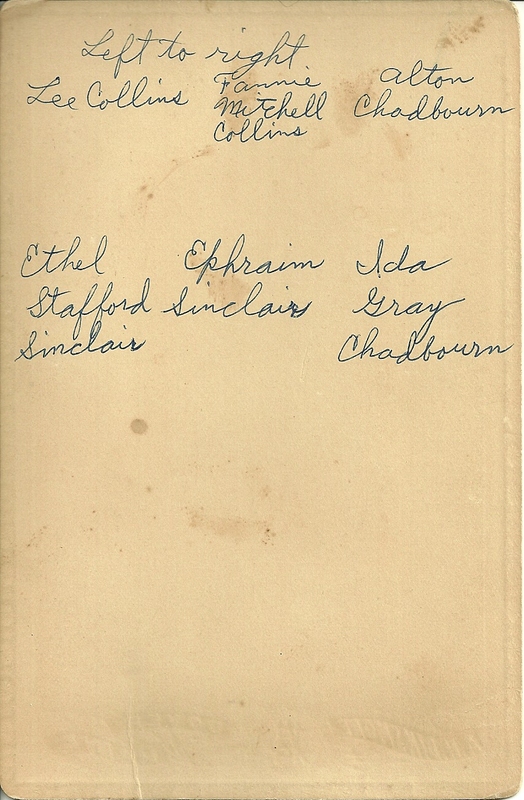 Her maternal grandparents were Obadiah and Rebecca (Gray) Stafford. 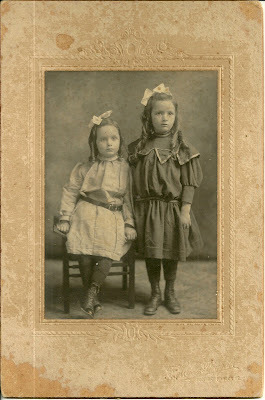 I found at least two children for John Lee and Fannie Emmie (Mitchel) Collins, both daughters, born not long after 1900. If you have any corrections, additions or insights regarding the information presented here, please leave a comment or contact me directly. Thanks! For more information on John Collins, Sarah A. Shorey, John Lee Collins and Fannie Emmie Mitchell, click on their names to see their pages at the Maine and Maritime Canada Genealogy network. A map of Somerset County, Maine, featuring Harmony, Cornville, Skowhegan, Wellington and Bingham. A map of Waldo County, Maine, featuring the villages of Unity and Troy. 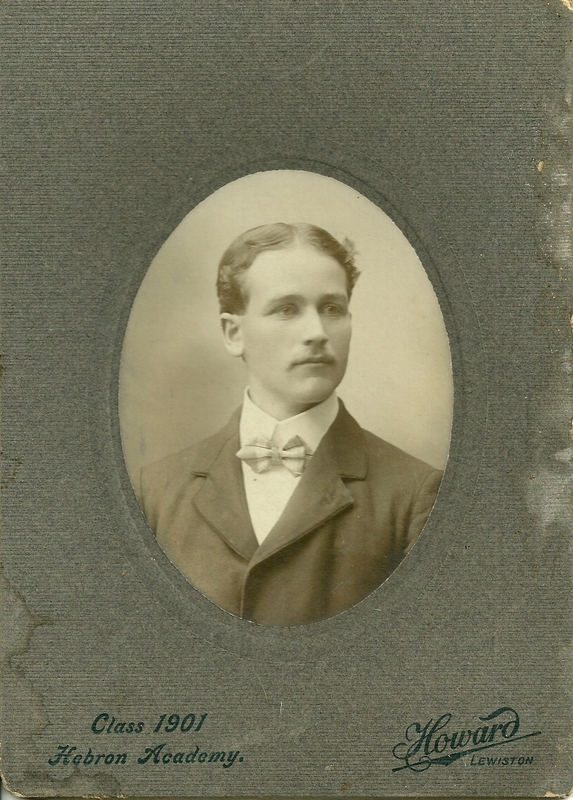 Cabinet photograph of a young man identified on reverse as Fred Colley. There's an inscription on the reverse that is a bit confusing, as you can see for yourself, below. 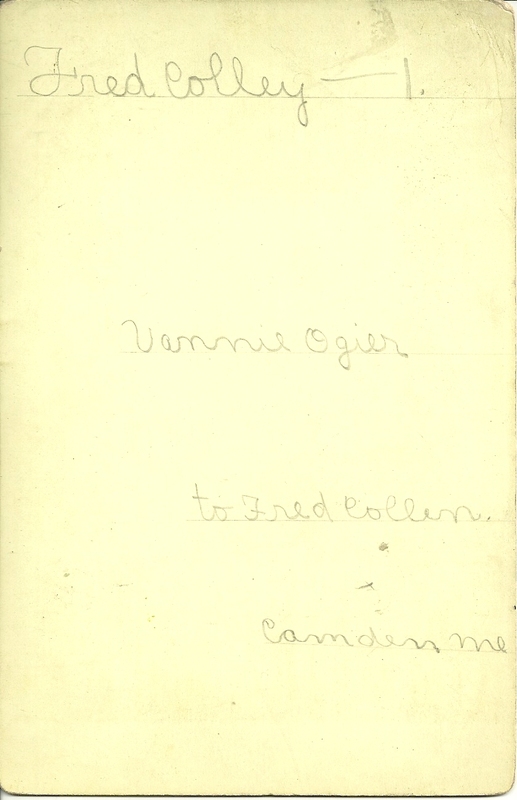 It appears that the photograph was a gift from Vannie Ogier to Fred Collen. However, I'm hoping the name at the top, Fred Colley, correctly identifies this young man. 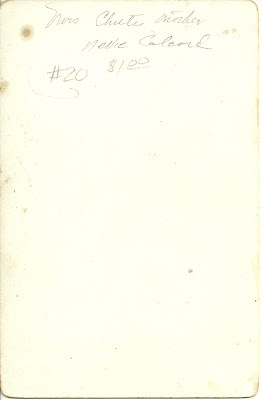 See an inscription Fred wrote in the autograph album of Vanetta E. (Ogier) Heal, "Vannie", here. Fred L. Colley was born about 1861 in Maine, the son of Lemine Colley and his wife Josephine (Wormwood) Colley. I found Lemine sometimes referenced as Lomine and as Lemuel. I believe Fred's paternal grandparents were William Colley and Mary Polly (Kidder or Ridden) Colley, born in Gray, Maine, and Albion, Maine, respectively, thanks to an excellent website, Early Families of Albion, Maine. There was a William Colley, age 81, living with Lemine and family at Belfast, Maine, at the time of the 1870 Census. Had he lived to the enumeration of the 1880 Census, his relationship to Lemine as head of the household would have been explained. 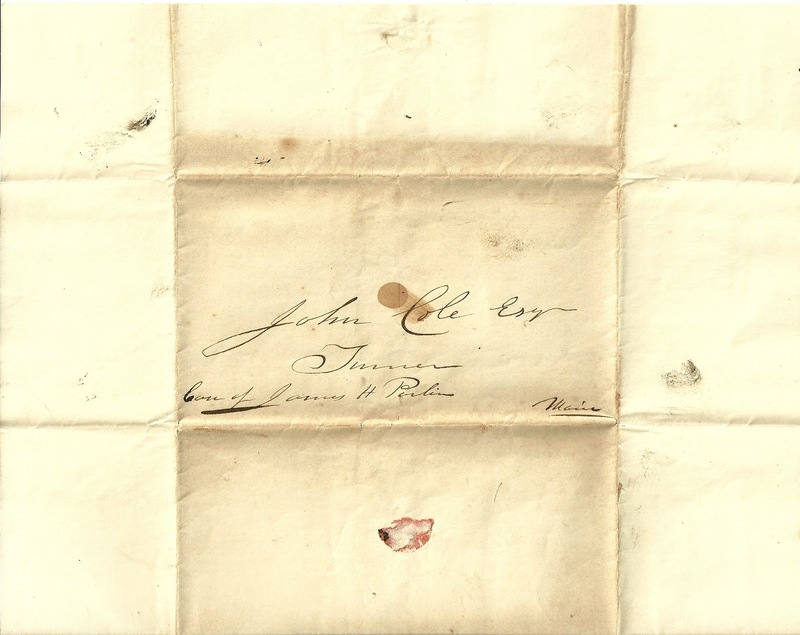 Just to throw a monkey wrench, I also found a record where a William Colley married a Lydia Noyes in 1810. Lydia was born in Cumberland, Maine, in 1787, the daughter of Samuel and Lydia Elizabeth Noyes. If you have information as to the parents of Lemine Colley, I would appreciate hearing from you. Fred's maternal grandparents were John and Phylena (Witham) Wormwood, both born in York County, Maine, in Alfred and Sanford respectively. It's always interesting to speculate on how a couple met. Lemine of Belfast and Josephine of Sanford married in Portland on 19 July 1850. On 15 October 1901 at Arlington, Massachusetts, Fred Colley married Kate P. Welch, who was born at Belfast, Maine, about 1871, the daughter of Mathew and Martha "Mattie" (Perkins) Welch of Belfast. Kate's paternal grandparents were Peter and Annie Welch, each born in Ireland. Her maternal grandparents were Josiah and Ruth W. (Leach) Perkins, born in Penobscot and Bucksport, Maine, respectively. Fred, Kate and Fred's sister Nellie were living in Arlington, Massachusetts at the time of the 1910 Census. In the 1920 Census, Fred and Kate were living in Boston, Massachusetts, where Fred was working as a manufacturer of metal signs and Kate was working in a law office. Nellie was no longer living with them; she was back in Belfast, Maine, for the 1920 and 1930 Censuses. I don't know if Fred and Kate had any children. 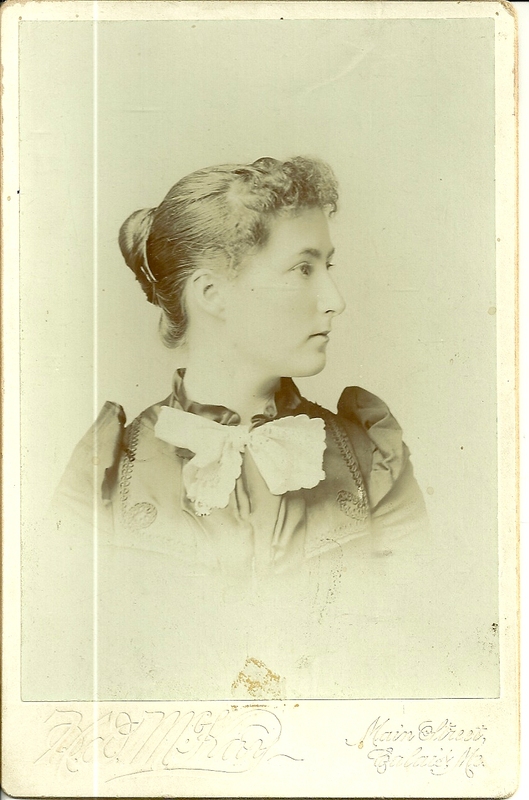 As for Vannie Ogier, she was Vanetta E. Ogier, born 16 February 1870 at Camden, Maine, the daughter of Samuel Emery Ogier and wife Martha Ann (Heal) Ogier, born in Rockport, Maine, and Searsmont, Maine, respectively. Her paternal grandparents were Robert and Mary (Trussell) Ogier. Her maternal grandparents were John and Deborah (Heal) Heal. About 1889, Vannie married her cousin James Henry Heal, who was born in February of 1868 to Henry and Julia Heal of Searsmont, Maine. His paternal grandparents were John and Deborah (Heal) Heal. His maternal grandparents were James Madison Dickey and wife Nancy (Milliken) Dickey. Vannie and James had two children, possibly three. Sadly, Vannie died in December of 1906 at Camden, Maine. In 1908, James married Bertha L. Green. If you have any corrections, additions or insights regarding the information presented here, or if you have another candidate for the fellow in the photograph, please leave a comment or contact me directly. Thanks! For more information, see the page on the Maine and Maritime Canada Genealogy network for Fred Colley. Map of Belfast Maine: zoom out to see Camden down the coast a bit and Searsmont inland. 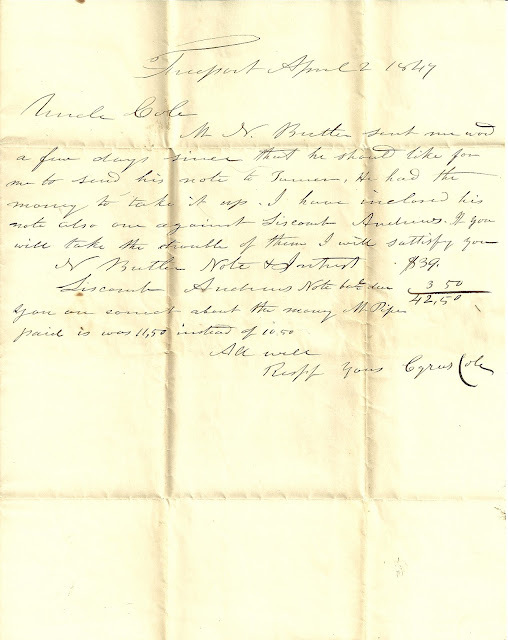 April 2, 1847 letter from Cyrus Cole, then living at Freeport, Maine, to his uncle, John Cole, living in Turner, Maine, perhaps in the household of James H. Parlin. 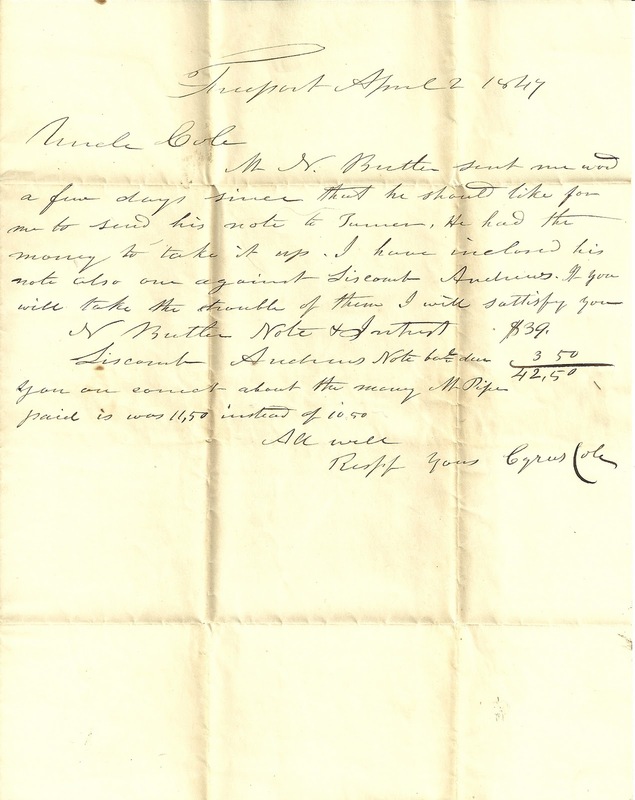 M. N. Butler sent me word a few days since that he should like for me to send his note to Turner. He had the money to take it up. 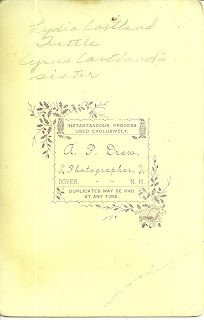 I have included his note also ours against Liscomb Andrews. f you will take the trouble of them. I will satisfy you. 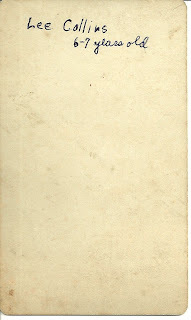 N. Butler Note + Interest $39. Cyrus Cole was born 28 February 1814 at Winthrop, Maine, the son of William and Lupira (Spaulding) Cole. His paternal grandparents were John and Annah Sturdivant (Morrell) Cole. His maternal grandparents were Benjamin and Myrtilla (Robinson) Spaulding. On 29 September 1840 at Buckfield, Maine, Cyrus married Sarah A. DeCoster, who was born 18 June 1817 at Buckfield, Maine, the daughter of Samuel and Sarah (Bacon) DeCoster. Her paternal grandparents were Jacob DeKoster (or Jacobus DeKoster) and his wife Priscilla (Rogers) DeKoster. 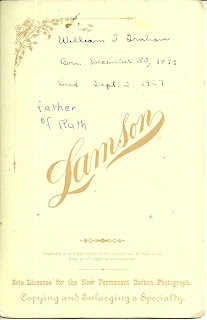 Her maternal grandparents were James and Joanna (Hamblin) Bacon. The couple had no biological children but raised an adopted son, Charles M. Cole, who was born in 1867 and died in 1958. I found that a couple has done extensive work on this family and posted their results at the Find A Grave network. 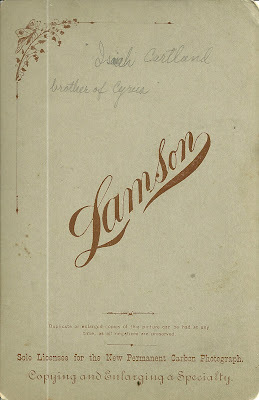 In addition to an interesting bio of Cyrus, there are links to pages for many of his relatives and in-laws. For more information, please visit the Maine and Maritime Canada Genealogy network to view the page of Cyrus Cole and Sarah A. DeCoster. 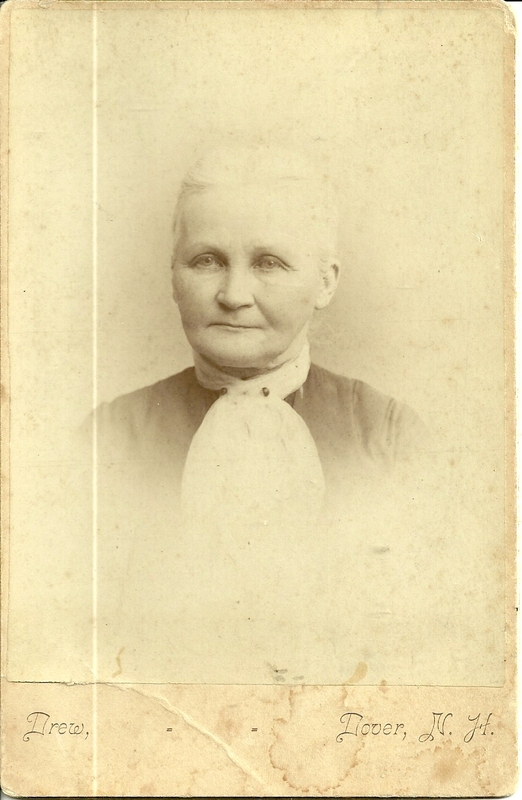 Photograph of a woman identified on reverse as Nellie Colcord, mother of Mrs. Chute. 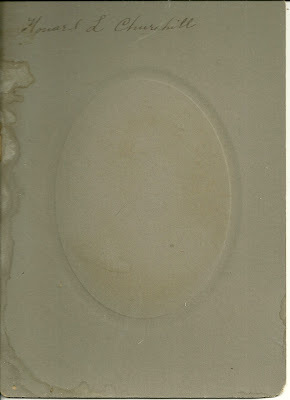 The photograph was taken by the H. M. Smith studio of Portland, Maine. Eleanor "Nellie" B. Staples was born in December of 1860 in Maine, the daughter of Wilbert M. and Adeline "Addie" E. Staples. I'm shying away from identifying her grandparents as I found multiple options. Perhaps a reader with knowledge of the family will step forward. On 18 October 1881, at Portland, Maine, Nellie married Albert C. Colcord, who was born in July of 1858, the son of William David Colcord and his wife Eleanor D. (Hichborn) Colcord. I found several possibilities for William David Colcord's parents online. Eleanor Hichborn's parents were, I believe, Paul Revere Hichborn and his wife Eleanor (Dickey) Hichborn. 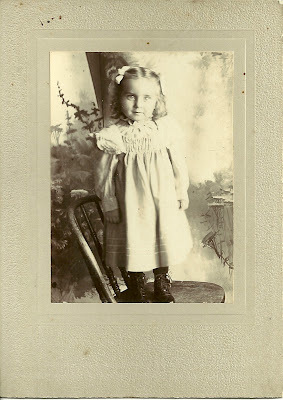 Nellie and Albert had at least one child, a daughter Evelyn Colcord, born 3 July 1883 in Stockton Springs, Maine, the person indicated on the reverse of the photograph. She married Harry David Shute. He was born 20 October 1883 in Stockton Springs, Maine, the son of Elden Soule Shute and his wife Clara B. (Berry) Shute. For more information on Eleanor "Nellie" B. 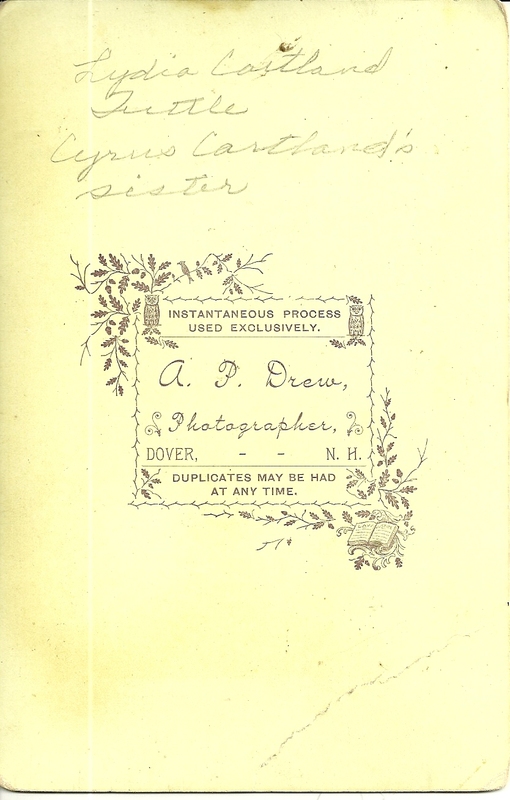 Staples and her husband Albert C. Colcord, see their page at the Maine and Maritime Canada Genealogy network. 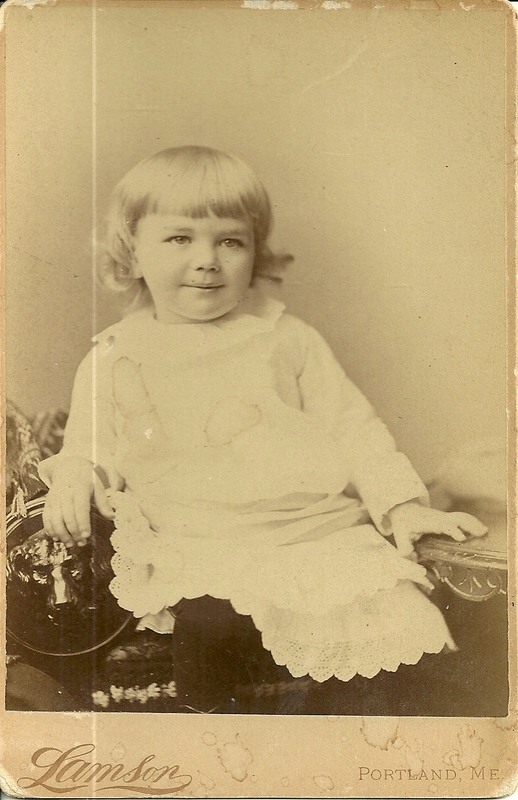 Photograph of Madge Eleanor Clarke as a 27 month old child. 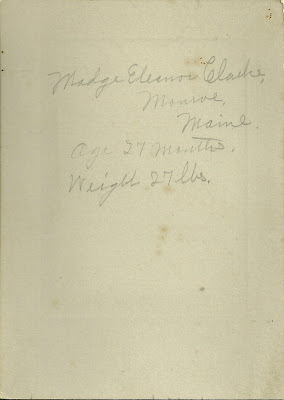 Madge Eleanor Clarke was born 8 July 1898 at Monroe, Maine, the daughter of Walter Perkins Clarke and his wife Ella H. Jellison, born in Winterport or Frankfort, Maine, and Hancock, Maine respectively. 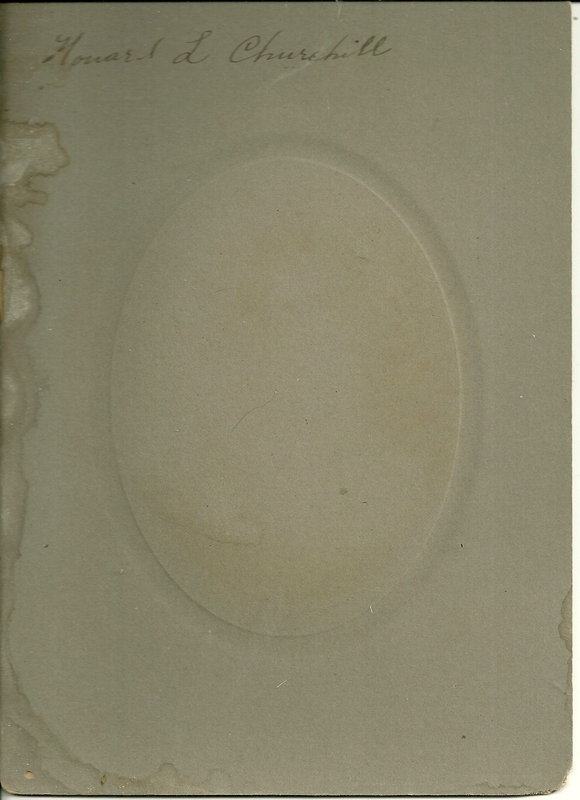 I found official records using the surname Clark, so it's possible the person who provided the identification information on the reverse of the photograph was correct, or incorrect. Her paternal grandparents were Jeremiah and Elizabeth Hannah (Perkins) Clark. I'm not sure of her maternal grandparents. 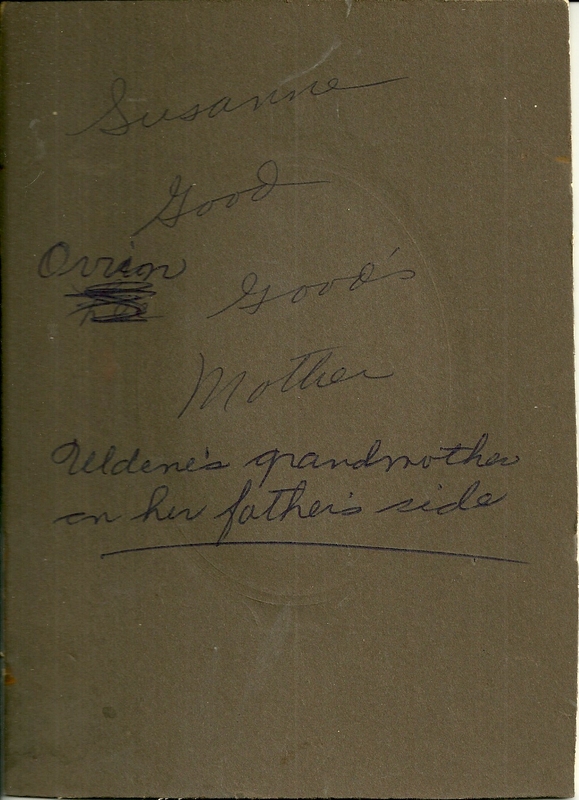 I believe her grandmother was Hattie M. Jellison, daughter of Nahum Young Jellison and his wife Mary (Abbott) Jellison of Hancock, Maine. On her marriage record, she put Nahum and Mary (Abbott) Jellison as her parents, but I believe they were actually her grandparents. I couldn't find a marriage record in the Maine archives for Madge Eleanor Clarke or Clark. She could have married out of state or perhaps not at all. The last record I found of her was the 1920 Census, when she was living with her parents and working as a teacher in a rural school. 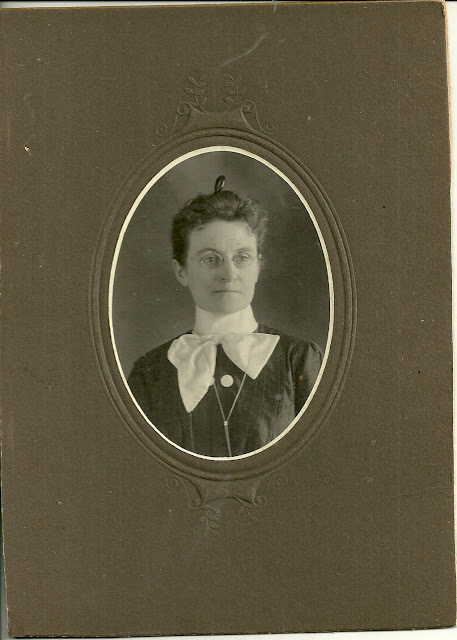 For more information, see the page for Madge Eleanor Clarke at the Maine & Maritime Canada Genealogy network. Photograph of Howard L. Churchill, Class of 1901 at Hebron Academy, Hebron, Maine. 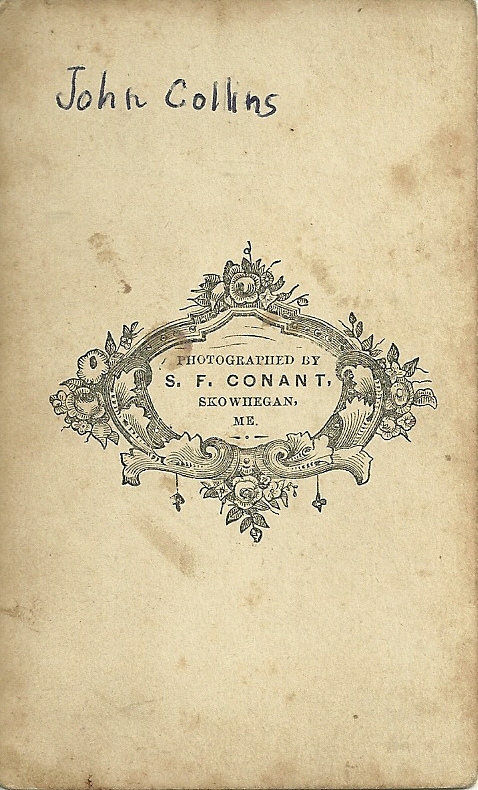 The photograph was taken by the Howard studio of Lewiston, Maine. From online research, hopefully correct, and hopefully with the correct Howard L. Churchill. The Howard I've outlined below was born in 1877, which seems a bit old for someone from the Class of 1901, but I didn't find anyone more apt. Please let me know if you have another option. Howard Lincoln Churchill was born 25 July 1877 at Buckfield, Maine, the son of Asaph and Sarah Frances (Murch) Churchill. His paternal grandparents were Martin and Betsy (Churchill) Churchill. His maternal grandparents were Benjamin Bailey Murch and his wife Mary Bird (Faunce) Murch. On 25 July 1906, at Portland, Maine, Howard Lincoln Churchill married Lila Belle Fletcher. 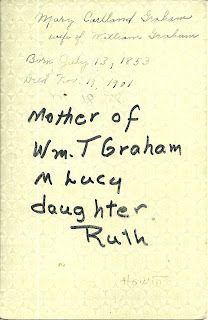 She was born in May of 1881, the daughter of Gideon and Laura E. (Keene) Fletcher. Her paternal grandparents were Daniel and Mary (Stetson) Fletcher. I haven't as yet found her maternal grandparents. I found some online trees with different parents for Lila Belle Fletcher, but thanks to recently available Maine Marriage Records 1705-1922, her parents were listed as Gideon and Laura E. Keene, both born in Buckfield, Maine. 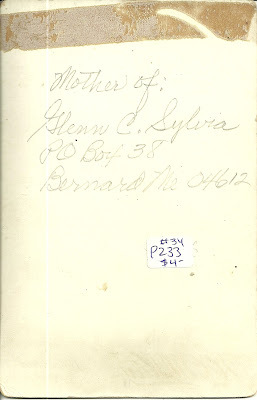 Note: for some reason, the powers that be chose not to index the maiden name of the mother in this database, so be sure to view the original document. As if that weren't enough, in this case, the father's first name was indexed incorrectly as Gideau. Howard and Lila lived in Massachusetts and New York. I found them in the 1910 Census in Massachusetts and in the 1920 and 1930 Censuses in Glens Falls, New York. Howard died in 1943. I don't have a date of death for Lila. If you have any corrections, additions or insights regarding the information presented here, or if you think the photograph is of another Howard L. Churchill, please leave a comment or contact me directly. Thanks. For more information, see the page for Howard Lincoln Churchill and his wife Lila Belle Fletcher at the Maine and Maritime Canada Genealogy network. 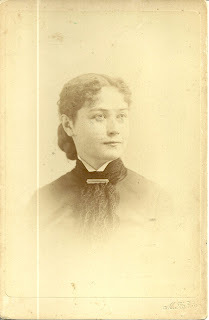 Photograph of Susanne Mary (Cheney) Good, wife of Charles F. Good of Monticello, Maine. Susanne Mary Cheney was born 22 November 1860 at Lindsay, New Brunswick, Canada, the daughter of Thomas B. and Ann "Nancy" (Bagley) Cheney. Her paternal grandparents were Stephen P. and Elizabeth (Burpee) Cheney. Her maternal grandparents were Samuel and Mary (Bell) Bagley. Susanne married Charles F. (possibly Frederick) Good, who was born 7 April 1856 at New Brunswick, the son of James and Charlotte (Good) Good. His paternal grandparents were David and Mary (McKeen) Good. His maternal grandparents were Solomon and Sarah (Long) Good. Susanne and Charles raised a family of five at Monticello, Maine. Their son Orrin Lawson Good was the father of Uldene, who is mentioned on the reverse of the photograph. 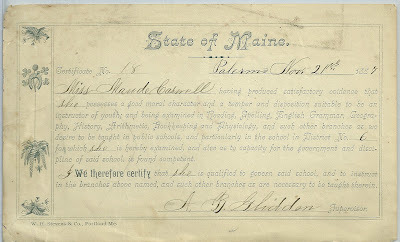 1887 State of Maine Certificate No. 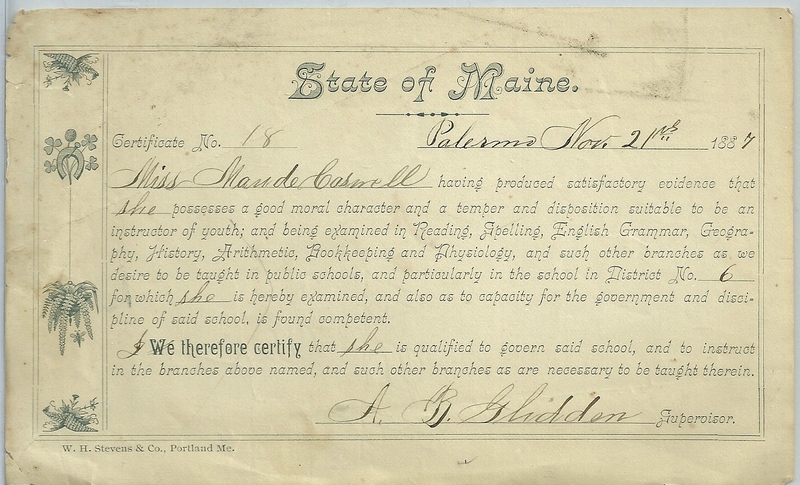 18 for Palermo, Maine, November 21, 1887 certifying Miss Maude Caswell as competent to teach in the subjects of Reading, Spelling, English Grammar, Georgraphy, History, Arithmetic, Bookkeeping and Physiology. The certificate was signed by A. B. Glidden, Supervisor. 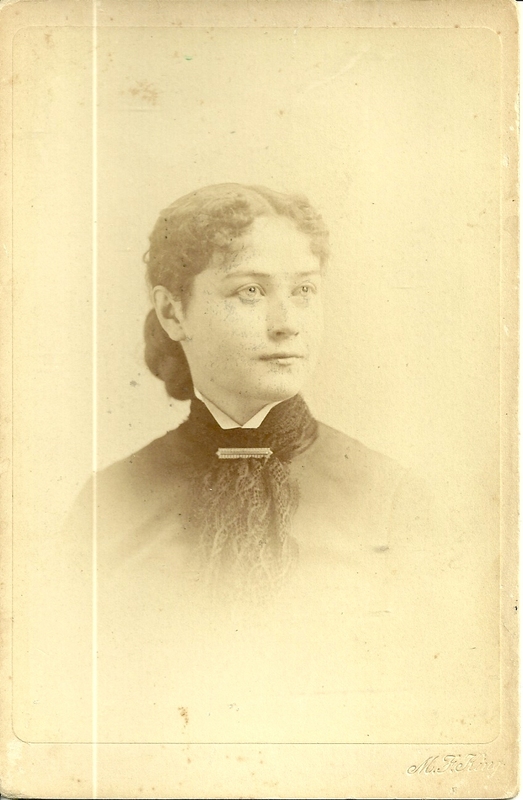 Maude Nettie Caswell was born in 1867 in Maine, perhaps in Union, the daughter of Lendall Caswell and his wife Ellen (Gower) Caswell. Her paternal grandparents were Judson and Mercy Dyer (Mitchell) Caswell. I haven't as yet found the parents of Ellen Gower, but I found where an Augusta Gower, about ten years younger than Ellen, was living with the Lendall and Ellen Caswell family in the 1870 Census of Union, Maine. Whether Augusta was a sister or sister-in-law or other relative, I haven't yet determined. George D. Rowe was a physician in Augusta, Maine. He was associated with the Maine State Asylum, now known as Riverview Psychiatric Center. I found George and Maude living in Providence, Rhode Island in the 1910-1930 Censuses. No one else was listed as living with them. I haven't yet found them in the 1900 Census, so am not sure if they ever had any children. If you have any corrections, additions or insights regarding any of the information presented here, please leave a comment or contact me directly. Thanks. See the page for Maude Nettie Caswell and her husband George D. Rowe at the Maine and Maritime Canada Genealogy network. 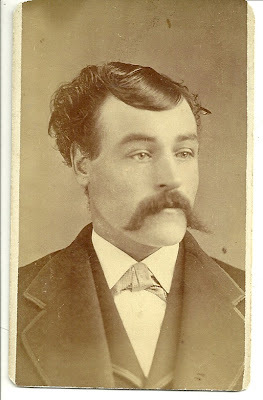 Carte de Visite of "Uncle Ed. 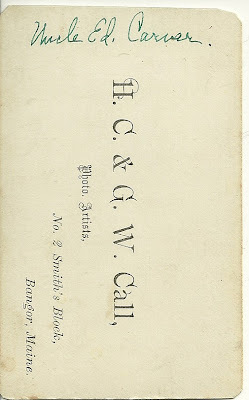 Carver" taken by Studio of H. C. & G. W. Call, Photo Artists, No. 2, Smith's Block, Bangor, Maine. 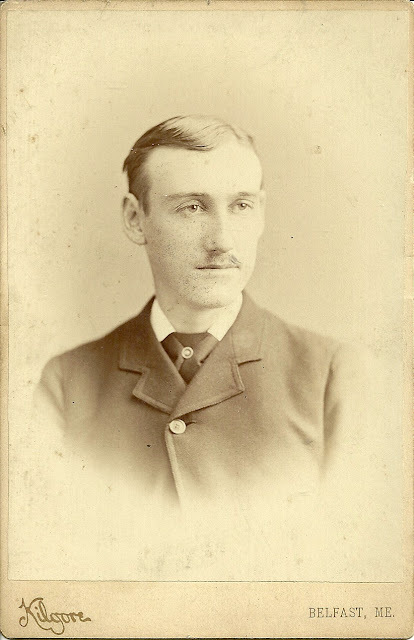 Edward Kent Carver was born 13 December 1841 at Lagrange, Maine, the son of Cyrus and Mary A. (Waterhouse) Carver. His paternal grandparents were Nathan and Hannah (Matthews) Carver, born in Massachusetts and Maine respectively. His maternal grandparents were John and Elizabeth (Jackson) Waterhouse. Edward Kent Carver served in the Civil War in Company B, Maine 20th Infantry Regiment. He mustered in on 29 August 1862 and mustered out 15 June 1864. On 13 November 1870, Edward Kent Carver married Eunice Babson Merrill, who was born 30 October 1845 at Bangor, Maine, the daughter of Joseph Raynes Merrill and his wife Tamson Babson Gray. Her paternal grandparents were Charles R. and Eunice (Raynes) Merrill. 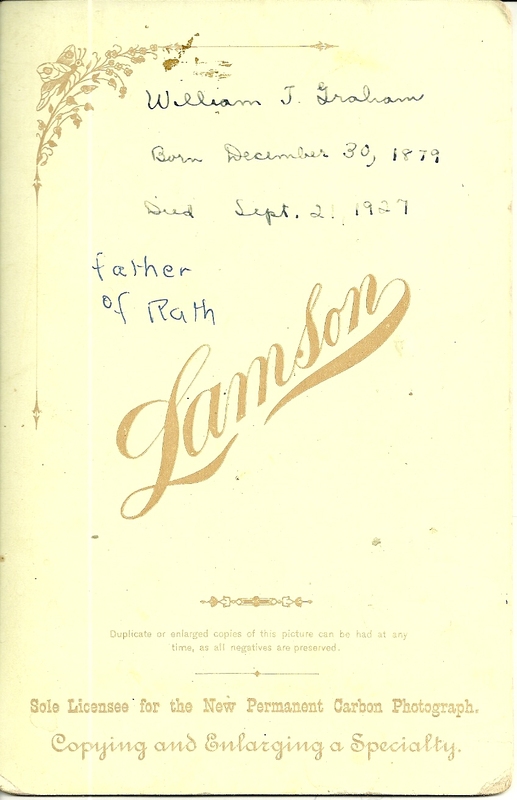 I don't as yet have information on Tamson Babson Gray's parents. The couple settled in Glenburn, Maine, which is adjacent to Bangor, and raised a family of six children: Cyrus W. Carver; Gertrude Carver; Mary Annie Carver; Joseph R. Carver; Margaret Merrill Carver; Mahala Maude Carver. Edward Kent Carver died at Glenburn on 23 January 1899. His widow Eunice died at Glenburn on 18 February 1921. Visit the page of Edward Kent Carver and Eunice Babson Merrill at the Maine and Maritime Canada Genealogy network. Four cabinet photographs of the Cartland and Graham families: Isaiah Cartland (shown above); Isaiah's daughter Mary Rich Cartland, who married William Graham, Scottish immigrant; Mary's son William T. Graham; Isaiah's sister, who was the second wife of William Penn Tuttle of the historic Tuttle Farm family. 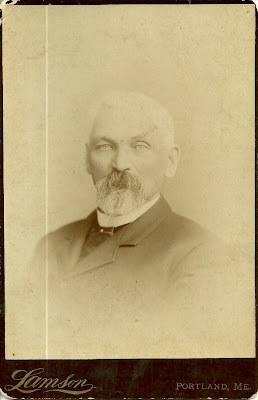 Isaiah Cartland was born on 9 September 1829 at Windham, Maine, the son of Charles and Miriam (Robinson) Cartland, both born in New Hampshire. His paternal grandparents were Pelatiah and Anna (Hanson) Cartland of New Hampshire. His maternal grandparents were Stephen and Content (Alley) Robinson, born in Kittery, Maine, and New Hampshire respectively. On 24 August 1852, Isaiah Cartland married Eunice Hacker Rich, who was born 27 December 1827 at Lynn, Masachusetts, the daughter of Thomas and Eunice (Jones) Rich. Isaiah and Eunice lived in Portland, Maine and raised a daughter, Mary Rich Cartland and a son Thomas P. R. Cartland. Mary Rich Cartland, whose photograph appears above, was born 13 July 1853 at Brunswick, Maine, the daughter of Isaiah and Eunice Hacker (Rich) Cartland. Her paternal grandparents were Charles and Miriam (Robinson) Cartland. Her maternal grandparents were Thomas and Eunice (Jones) Rich. 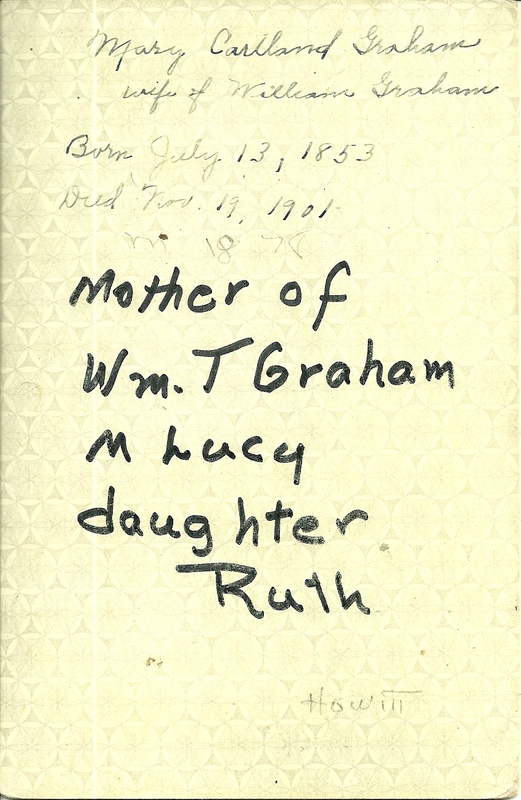 In 1878, Mary Rich Cartland married William Graham, who was born in Scotland, perhaps in April of 1853. I don't as yet have information on his parents, though I assume they were also immigrants to the United States, as William was only about three when he arrived here. Mary Rich (Cartland) and William Graham lived at Portland, Maine and had at least three children: William T. Graham; Eunice M. Graham and Paul G. Graham. Their son William T. Graham was born 30 December 1879 at Manchester, New Hampshire. On 24 April 1907, he married Lucy Ellen Cartland, who was born 11 December 1879, the daughter of Charles Everett Cartland and Frances Ellen (Tracy) Cartland. Her paternal grandparents were Cyrus and Phoebe Rogers (Jones) Cartland. Cyrus was the brother mentioned on the reverse of two of the photographs above. 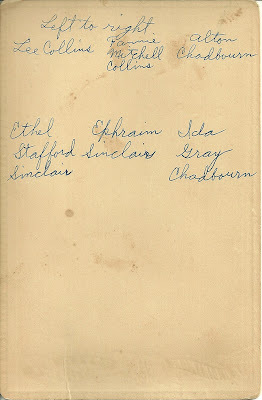 Lucy Ellen Cartland's maternal grandparents were John Orr Tracy and his wife Octavia Philbrook. 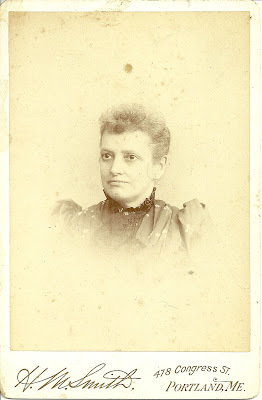 The last photograph shows Lydia M. Cartland, Isaiah's sister. She was born 20 October 1831 at Windham, Maine, the daughter of Charles and Miriam (Robinson) Cartland. Her paternal grandparents were Pelatiah and Anna (Hanson) Cartland. Her maternal grandparents were Stephen and Content (Alley) Robinson. On 28 March 1872 at Strafford County, New Hampshire, she became the second wife of William Penn Tuttle of the historic Tuttle farm family. He was born 26 June 1823 at Dover, New Hampshire, the son of Joseph and Sarah (Pinkham) Tuttle. His paternal grandparents were William and Anna (Hanson) Tuttle. His maternal grandparents were Joseph and Elizabeth (Green) Pinkham. William Penn Tuttle's first wife was Mary Varney. After Lydia's death, he married Hannah Coffin Hanson. I believe his only child was with first wife Mary Varney, a son George E. Tuttle, who died in infancy. By the way, I've mentioned two Anna Hansons in this post, but they were different people. See the page for the Cartland family at the Maine and Maritime Canada genealogy network. 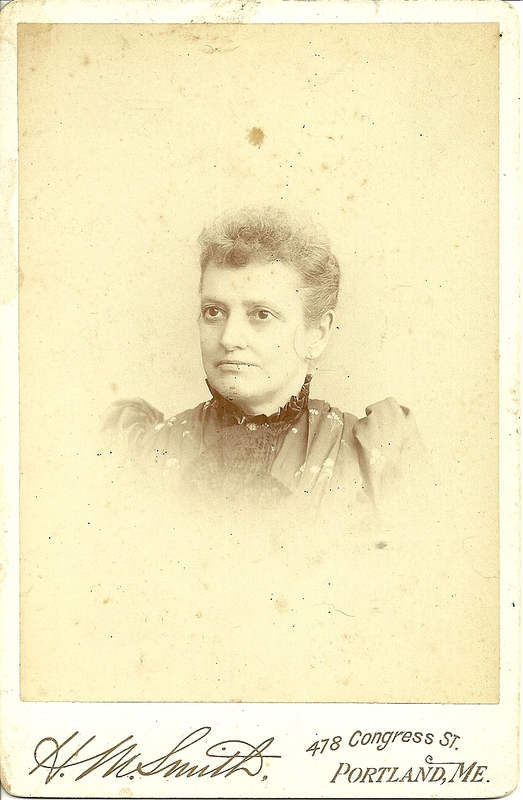 Cabinet photo of a young woman identified on reverse as the mother of Glenn C. Sylvia, PO Box 38, Bernard, Maine 04612. His mother was Lettie M. Carter, who married Edgar Everett Sylvia. Lettie M. Carter was born in October of 1876 at Edmunds, Maine, the daughter of Albert M. and Josephine (Jones) Carter. Her paternal grandparents were Samuel and Sarah (Cox) Carter. Her maternal grandparents were Nathaniel C. and Maribeth (whose maiden name and parents elude me) Jones. 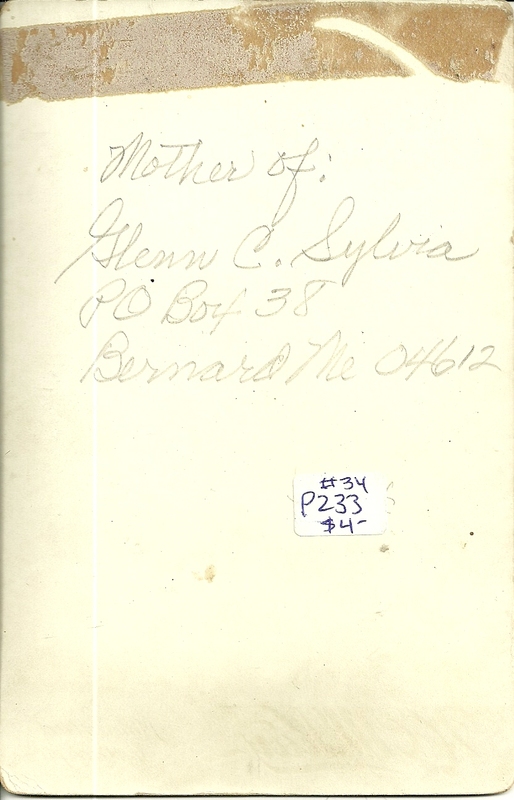 On 25 January 1897 at Edmunds, Maine, she married Edgar Everett Sylvia, who was born 27 February 1876, also at Edmunds, Maine, the son of Noah and Sophia (Gardner) Sylvia. His paternal grandparents were John LaSilva, reportedly from Portugal, and Lavinia (Morang) LaSilva. The LaSilva/Sylvia surname has several variations. 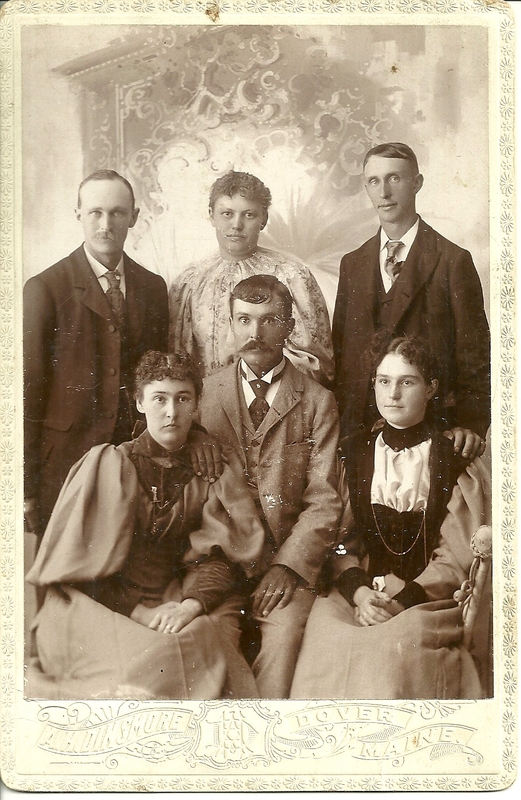 Edgar's maternal grandparents were Abner and Jane F. (Babb) Gardner. Lettie and Edgar raised a family in Edmunds, Maine, of at least five children: Esther Sylvia, born about 1898; Edna M. Sylvia, born about 1900; Edgar M. Sylvia, born about 1901; Wilhelmina S., born about 1911; and Glenn C. Sylvia, born in 1914. If you have any corrections, additions or insights regarding the information provided here, please leave a comment or contact me directly. Thanks! Edmunds, Maine is located in downeast Washington County, situated along Cobscook Bay. December 1907 photograph of sisters Ruth Marguerite Carney and Alice Gwendoline, who were born in Newcastle, Maine in the early 1900s. Ruth Marguerite Carney was born 5 September 1902 at Newcastle, Maine. Her sister Alice Gwendoline Carney was born 15 September 1903. They were the daughters of Franklin Irving Carney and his second wife Flora I. (Sprague) Carney. They had an older sister, Gladys Emma Carney, and a younger one, Dorothy. Their paternal grandparents were Franklin Lafayette Carney and his wife Cecilia A. (Mahoney) Carney. Their maternal grandparents were Elisha B. Sprague and his wife Mary Priscilla (Lash) Sprague. Their father was first married to Jennie M. Mosher, who died in 1896, after having three children: Richard, Marion and Doris. I found quite a bit of information online on Ruth and Alice's grandfather, Franklin Lafayette Carney, who was born in Boston and became a businessman and person of influence in the midcoast area of Maine. He got his middle name at the age of about six months when he was being held in the crowd as General Lafayette was riding by on a tour of Boston. Lafayette stopped to admire him and was told that the baby's middle name would be Lafayette from that point on. I believe that Ruth Margaret Carney never married. She died in 1982. See the page at the Maine & Maritime Canada network for Ruth Marguerite Carney. On 12 September 1928, Alice Gwendoline Carney married James Archibald Robinson, who was born 14 July 1906 at Minneapolis, Minnesota, the son of Harry Ellsworth Robinson and his wife Ruth Ella (Webster) Robinson. They are in the 1930 Census of Stamford, Connecticut. Alice died in 1989. See the page at the Maine & Maritime Canada network for Alice Gwendoline Carney. 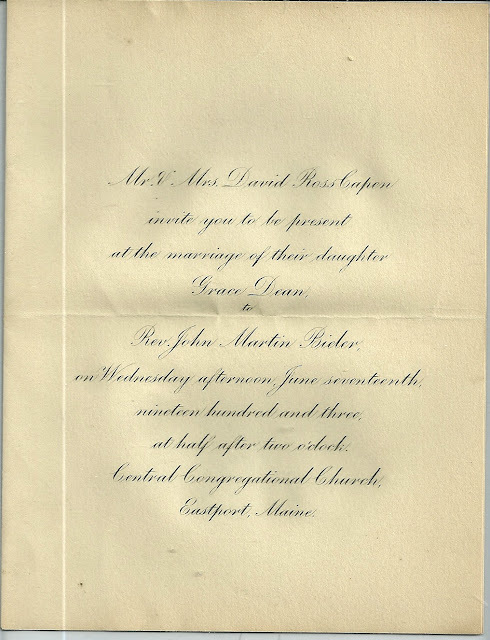 Invitation to the wedding of Grace Dean Capen and John Martin Bieler, to be held Wednesday afternoon June 17, 1903, at the Central Congregational Church, Eastport, Maine. Grace Dean Capen was born 8 May 1876 at Pembroke, Maine, the daughter of David Ross Capen and his wife Sarah A. (Dean) Capen, born in Eastport and Pembroke respectively. Her paternal grandparents were John and Sarah Lydia (Leighton) Capen. I haven't yet found the parents of Sarah A. Dean. John Martin Bieler, a minister, was born about 1873 in Germany. His parents' names appear on his marriage license but they are hard to decipher: perhaps Conrad Muhlbaurn and Christina Bauselder. Perhaps Conrad's last name was Bieler but this was assumed and not entered on the license. I found the couple with their daughter in the 1920 Census of Machias, Maine, where John's occupation was listed as Clergyman. I found a reference where John Martin Bieler graduated from the Hartford Theological Seminary in 1901. Visit the page at Maine & Maritime Canada Genealogy network for the page of Grace Dean Capen and her husband John Martin Bieler.